When you were a little girl, did you ever dream about being Cinderella? You know, playing and singing with the mice and the birds, finding your Prince Charming, and showing those ugly stepsisters that you really were the special one. I know I did--I wanted my own fairy godmother, too. "Bippity-Boppity-Boo!" Last month, a teacher friend asked me to come and talk to her students about what a "real" writer does. One question she wanted me to answer was, "How much do you write that actually never gets published?" Boy, she was asking the right person! So, while preparing my talk, I decided to include information about how many rejections I had received and how many of my picture book stories were still searching for a home, and so on. But would fourth graders be impressed with my statistics? 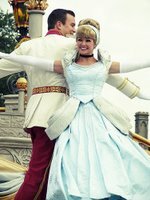 So, I wanted to find the perfect Cinderella story to wow them and show them that you should never give up on your words. J.K. Rowling has a great Cinderella story, and she would be somebody that the kids knew had been wildly successful. The story is that J.K. Rowling was a single mom, living on state benefits while she wrote the first Harry Potter manuscript. She got her idea in 1990, wrote for five years (sketching out the other six books, too), and a publisher finally accepted it in 1996 after being turned down by several large publishing companies because the book was too complex for kids! She did have an agent that believed in her--so even with an agent, the rumor is she was rejected 12 times by publishing companies. And you know the rest of this Cinderella story--she is now reported to be worth over 1 billion dollars.